Preheat oven to 375. Place peaches in a small casserole dish and squeeze lemon over each peach half. 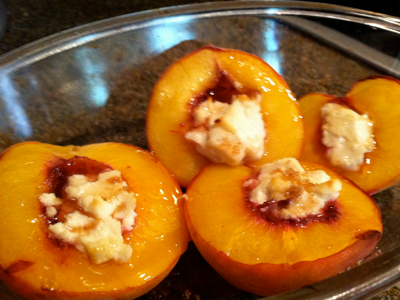 Sprinkle 1 Tablespoon brown sugar over all peaches (1 Tablespoon total amount; not for each peach), then add about 1 teaspoon of honey goat cheese in the center of each peach (where pit was). Roast peaches for about 25 to 30 minutes (until peaches are soft). Remove from oven and drizzle with honey, if desired. Enjoy!